Once you wade through the multitude of information out there about optimal protein intake the next stumbling block is what type of protein you should be using. For the most part, widely available protein supplements contain whey protein, but there are other proteins out there, specifically casein. So what are the differences and benefits with each? Proteins are large biomolecules consisting of one or more long chains of amino acid residues. Proteins perform a vast array of functions within organisms, including catalysing metabolic reactions, DNA replication, responding to stimuli, and transporting molecules from one location to another. Proteins differ from one another primarily in their sequence of amino acids, which is dictated by the nucleotide sequence of their genes, and which usually results in protein folding into a specific three-dimensional structure that determines its activity. All proteins contain carbon, hydrogen, oxygen, and nitrogen, some contain sulfur them. These elements make up the building blocks of proteins – the amino acid residues of which there are twenty basic types. Quite simply, essential amino acids must be obtained through diet your body is incapable of synthesizing them. Nonessential amino acids are still important to construct your body’s proteins, but it is not necessary for them to be ingested as the human body is capable of synthesizing them. Protein is metabolized as a source of energy when you are experiencing a negative caloric balance when the bodies proteins are broken down for energy it is known as catabolism. Therefore, there is an inverse relationship between caloric intake and protein requirement to maintain or build muscle. When caloric intake goes down, protein intake requirements go up. The opposite is also true. Those experiencing a negative caloric balance or who consume low-quality proteins will need an even higher intake of protein to maintain or build muscle. Similarly, if you’re exercising regularly your protein requirements will be increased due to training. Both aerobic endurance training and anaerobic resistance training will increase your protein intake need. In athletes, protein is required for tissue repair, the use of branched-chain amino acids for fuel and to maintain a positive nitrogen balance. Whey protein is the most common supplement you’re going to find, it’s cheap, easy to consume, and readily available. Whey is a component of cow’s milk and accounts for about 20% of its protein content. Whey protein is a byproduct of cheese and yogurt production, hence its availability. Whey protein is made up of all the essential amino acids and is very high in branched-chain amino acids, which are the keys to muscle protein synthesis. Whey protein is relatively high in sulfur-containing amino acids when compared to casein, which makes it have a slightly higher level of biological utilization. Whey is often considered a fast protein source as it digests very quickly leading to a rapid increase in amino acid levels in the bloodstream. Blood amino acid levels peak at 60-90 minutes following ingestion. The fast absorption does lead to a fair amount of the protein being oxidized, in other words wasted, as the body is not capable of assimilating a large amount of whey quickly. So going for that second scoop of whey after a workout will offer up greatly diminishing returns. Casein protein is the most abundant form in cow’s milk, making up about 80% of its protein content. Similar to whey, casein is a complete protein containing all the essential amino acids. Unlike whey, it contains a lower percentage of branched-chain amino acids and has a lower biological utilization rate. 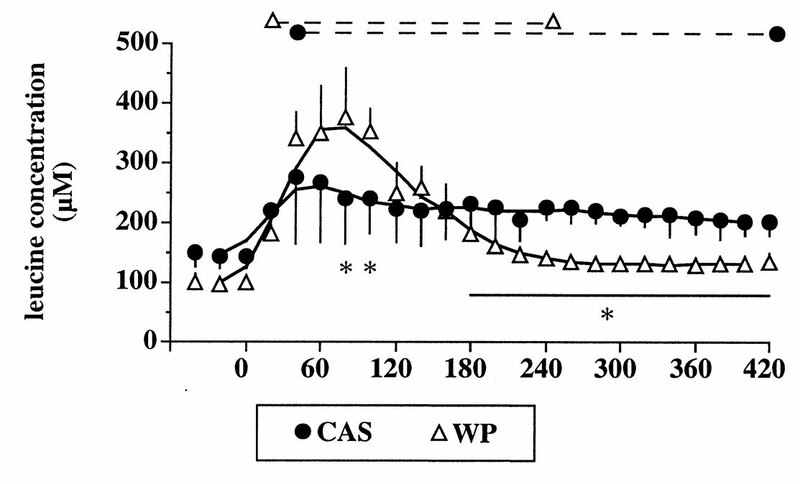 Casein is termed a slow-digesting protein. The body digest casein’s amino acids in a much more steady manner compared to whey and amino acid levels are maintained in the blood well after ingestion. In fact, casein produces a stable elevation of amino acids in the bloodstream for up to seven hours. Because casein delivers a more steady level of amino acids without a strong spike, less protein is oxidized. Casein produces a greated overall protein balance compared to when and is usually know as anti-catabolic because of it’s slow acting nature. Whey protein is the perfect choice for morning supplementation or use as a post-workout protein for muscle repair. It’s quick digesting, so it hits the blood quick and starts feeding muscles. It’s also been shown to have some fat loss benefits not exhibited by casein. Casein is ideal for nighttime protein supplementation or as a meal replacement. Since casein is so slow acting, it is not ideal for post-workout. Casein is the ideal protein for a pre-bedtime snack. While you sleep, you have the greatest opportunity for muscle repair, and casein can maintain a steady state of amino acid availability in the blood to do just that. 1. Bendsten, LQ. et.al “Effects of Hydrolyzed Casein, Intact Casein, and Intact Whey on Energy Expenditure and Appetite Regulation: a Randomized, Controlled, Cross-Over Study.” The British Journal of Nutrition (2014): 1412-1422, accessed November 16, 2014, doi: 10.1017/S000711451400213X. 2. Llewellyn, W. Sport Supplement Reference Guide. (Florida: Molecular Nutrition, 2009), kindle edition. 3. Baechle, Thomas R., Earle, Roger W. (2008). Essentials of Strength Training and Conditioning. Nebraska. Human Kinetics 207-208. 4. Tate, P., Seely’s Principles of Anatomy and Physiology. (New York: McGraw Hill Companies, 2012), 37-38, 694. 5. Abrahams, P., How the Body Works. (New York: Metro Books, 2007), 260. Is Organic Food Really Better? Healthy Food or Trendy Scam?